Request, record, and inform partners of user consent of data collection, using the power of the Kochava SDK. The General Data Protection Regulations (GDPR) require more transparency and openness about how companies use consumer data. The regulations are intended to protect the data rights of residents in the European Union but affect companies worldwide. To provide an effective way to ask their clients for permission to use their data. After a user has given their permission, marketers must have a way to log the user’s consent and inform all the other parties in the app. Intelligent Consent Management facilitates all of these measures, using the Kochava SDK. Intelligent Consent Management initializes with the SDK, and first determines if the user is located in the EU. It then determines if the user has already withdrawn their consent, or given their permission to use the data. If this data isn’t found, or if other changes are noticed (such as an increase in the number of media partners in the app), Intelligent Consent Management requests user consent again on the data permissions specified by the marketer. If the user consents, their agreement is recorded along with the Kochava User ID, a secure, anonymous identifier. Intelligent Consent Management then sends a real-time notification to every data partner the marketer works with, ensuring that the user’s choice is propagated throughout the marketers tool stack as quickly as they agree to consent. This data signal is completely configurable and allows for robust data control of the signal to all the different signal partners. 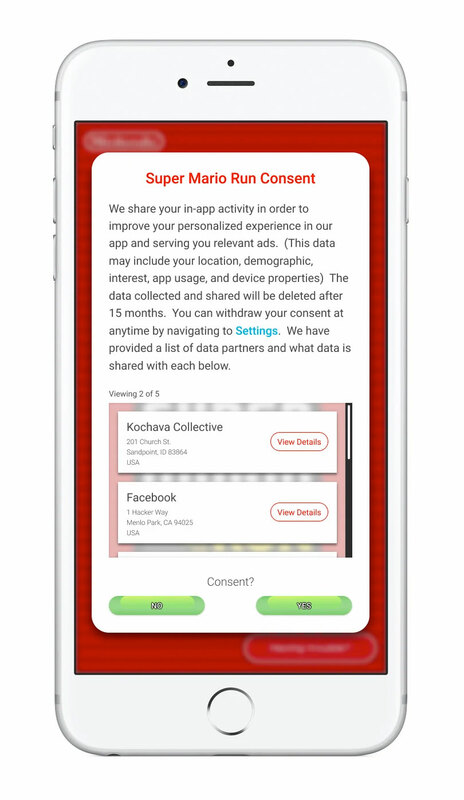 Intelligent Consent Management is managed directly from the Kochava Partner Configuration dashboard and can be used to inform all downstream metrics; for example, users that withdraw consent can automatically be excluded from audiences, push campaigns, and data exports. User consent is not given only once; rather, user permission must be requested again periodically based on elapsed time, changes in data use requirements, and changes in data partners. All of these use cases are included in the Intelligent Consent Management, which will notify users when any of these dynamically configurable triggers happen. Kochava Intelligent Consent Management ensures marketers’ compliance with GDPR and respect of user consent. It empowers both the end-user to protect their data as well as secures the marketer in their marketing efforts both in the EU and in the rest of the world as the marketing world evolves to a more user-consent-driven paradigm. Visit our FAQ page or contact us today to learn more! To learn more about Intelligent Consent Management, and the Kochava SDK, please fill out your info here.